So I’ve been working on a game to release to the new AppleTV store and found myself needing some artwork. 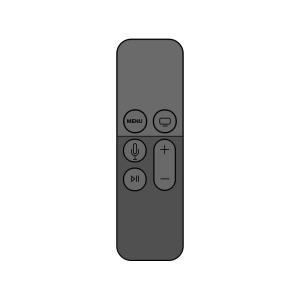 To be more specific, I needed an image of the new Siri Remote so that I could label the buttons for the players. In fear of my app being rejected for using any of Apple’s own artwork, I created my own drawing to represent the new Siri remote for the AppleTV. Please feel free to use this however you like. There are 2 attachments. One is a PNG and the other is PSD.